Berry Menthol (Blueberry Menthol) 3 x 10 ML ML E-Liquid 50-50 (VG/PG): Berries - Check; Menthol - Check: so it is off to a good start. I can taste the berries (blackberries seem to to me to be the dominant flavour) and the menthol infusion is just fabulous; another clear winner from Scripture. Berry Menthol (Blueberry Menthol) 30 ML E-Liquid has a well balanced formulation of 50-50 (VG/PG) which allows it to be used in almost every type of e-cigarette and every Dripper/Mod. 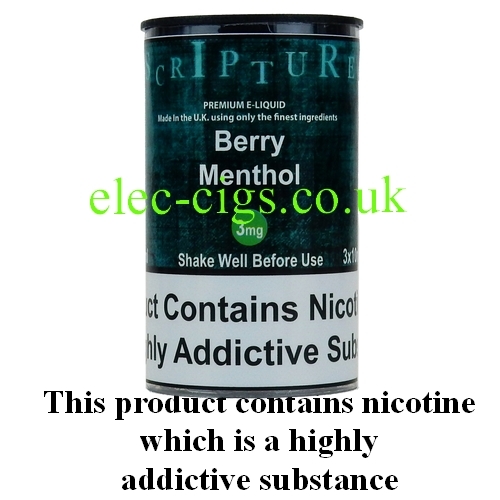 This Berry Menthol from Scripture is just one of a vast range of delicious flavours available in a choice of two nicotine strengths which can be vaped in any device. You can choose 3 mg (0.3%) nicotine, 6 mg (0.6%) nicotine or 12 mg ( 1.2%). A superb range proudly manufactured in the UK. 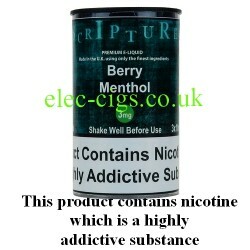 Berry Menthol (Blueberry Menthol) 30 ML (3 x 10 ML) E-Liquid can only be purchased by persons aged 18 years or over. The opinion of the e-liquid (above) is a personal and subjective assessment and is intended as a guide only. By purchasing this product you confirm that you are of a legal age to do so.